Around the holidays, making a heart-felt toast is de rigueur. We all know…and love that. And, it turns out, toasting is an around-the-clock opportunity in Las Vegas, the city that’s always open for fun. In fact, this year, visitors can transport the magic home with festive cocktails that will bring a splash of Vegas to every gathering. On the Strip and off, the coolest Las Vegas restaurants are inspiring food-loving tourists to make reservations—and mark their calendars. Within a decade, Las Vegas has redefined the culinary and wine and spirits experience by offering the most comprehensive collection of celebrity chefs, world-class restaurants and Master Sommeliers. So, here’s where we think might offer a heightened chance to toast to all your most…. Holiday Margarita at Bellagio Resort & Casino. This is a tasty recipe to spice up a spirited celebration. This festive drink from Petrossian Bar can be recreated in the comfort of your own home, too. Campfire Delight at The Cosmopolitan Las Vegas. Guests visiting this winter can enjoy The Ice Rink, a winter wonderland overlooking the heart of the Strip. High above Las Vegas Boulevard, guests can enjoy the brisk outdoors, fire pits, s’mores and warm cocktails including the Campfire Delight. Apples to Apples Mocktail at db Brasserie. Chef Daniel Boulud’s new, contemporary French restaurant at The Venetian Las Vegas. With robust flavors from around the globe, the team at db Brasserie gives an inspired and unique flavor to dishes from a menu that changes seasonally. Mixologists there have created the Apples to Apples mocktail, sure to delight all ages. Instructions: Build in tall Collins glass & garnish with lemon twist *The shrub is a mix of Gala apples shredded, mixed with brown sugar and Bragg's Apple Cider Vinegar. It marinates for about a week and then is strained and stored in air-tight jars. Red Nose Rocker at Cabo Wabo Cantina. Created by Sammy Hagar, it blends the laid-back, beach-town vibe of Cabo San Lucas, Mexico with the excitement of the Las Vegas Strip. Located center-Strip inside Miracle Mile Shops at Planet Hollywood Resort & Casino, Cabo Wabo Cantina combines a signature blend of authentic margaritas and fresh flavorful Mexican cuisine. To welcome Santa this year, the Red Nose Rocker was created to kick off the holiday season. The Jackpot at Lucky Bar is a truly festive drink. Located at the heart of Red Rock Casino & Resort casino floor, it offers a 360-degree view of all the action, as well as an alluring atmosphere seasoned with retro-modern décor and highlighted with cocktail servers decked out in custom handcrafted, one-of-a-kind gold-plated dresses that catch the eye from near or far. The Jackpot martini will add a touch of luck this holiday season. Instructions: Rub lemon juice on the rim of a martini glass, dip into cinnamon sugar and set aside. Add all ingredients and ice to a mixing glass and shake with Boston shaker. 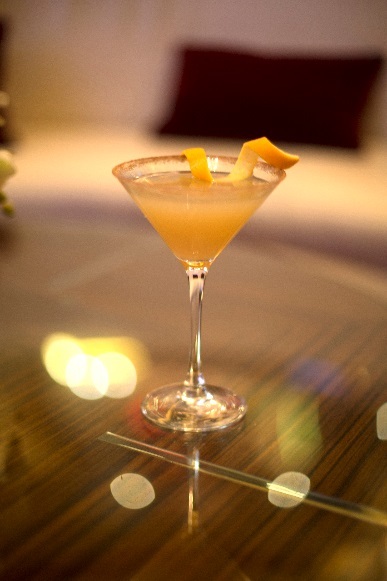 Strain into the cinnamon sugar rimmed martini glass, add an orange spiral for garnish.